Using research in the arena of massage therapy to make decisions about treatment options for clients is a good idea. It can help address troubling theories such as the one that titles this paper. When making decisions that can significantly impact a client’s well-being, it is certainly wise to look further afield for solid answers than just accepting an opinion of a fellow therapist or layman when not backed by solid evidence. First, we should take a look at the question “What is valid research?” We need to look at what the types of research are currently found in the area of massage practices. Research on massage therapy began to be published in the 1930’s, with human and animal studies, on such topics as muscle atrophy and blood flow, although sample sizes were relatively small in these discussions. These studies were also flawed in that control groups were frequently absent. In the subsequent years, scientific research has rectified many of the rough tactics of earlier researchers. There are increasing amounts of research becoming available through clinical studies of a serious nature and the results are being made available to those interested through the means of professional journals and associations. What types of research are valid and why are they valid for the profession? The gold standard for scientific research is to have a large sample tested using a control group in double blind testing. These studies should have as large of a sample group as is feasible in order to expect dependable results. While large samples have been arranged in the past, control groups often were given the alternate modality of a self-driven relaxation therapy. This would have to be considered single blind research, as the persons involved in conducting the experiment would be fully aware that massage was being compared to some other modality and could somehow skew the results. It is not such a simple situation as can be found in other treatment areas, where a blue pill might be given to everyone involved with the administrators being unaware of which blue pills had the actively tested ingredients. This frequently caused problems for many reasons, including the fact that control clients needed to be actively involved in their alternate therapies and frequently did not follow through with their assigned parts. Since the discovery that moderate pressure is needed for most massage therapy to be effective (1), control groups are now often given light pressure massage. This allows the control group to expect some benefit from massage treatment and also allows a means of double-blind testing in that the participating therapist many not be familiar with the findings of the above-mentioned pressure studies. They likely surmise that only the effects of light massage vs massage with more pressure was being measured instead of the true test of if massage was a valid treatment at all for the condition being studied, thus making it as close to a double-blind study as is possible in this area. What criteria do you use to determine if the information is valid or correct? The internet is a big place where anyone can publish their ideas. The researcher has to use discernment in determining if the source of information that they are reading is valid or not. Beyond checking the date of publication to ensure that you are seeing recent findings, there are a few questions that you can ask yourself about whether or not the information that you are presented with is from a reputable source. Who runs the website? A good health website will make it easy to learn who is responsible for the site and its information. What is the purpose of the website? Is the purpose of the site to inform? Is it to sell a product? Is it to raise money? If you can tell who runs and pays for the site, this will help you evaluate its purpose. Be cautious about sites trying to sell a product or service. What is the original source of the information on the website? Always pay close attention to where the information on the site comes from. Many health and medical websites simply re-post information collected from other website or sources. Sites that end in “.gov,” sponsored by the federal government, like the U.S. Department of Health and Human Services, (www.hhs.gov), the FDA (www.fda.gov), the National Institutes of Health (www.nih.gov), the Centers for Disease Control and Prevention (www.cdc.gov), and the National Library of Medicine (www.nlm.nih.gov). Sites that end in .edu which are run by universities or medical schools, such as Johns Hopkin University School of Medicine and the University of California at Berkeley Hospital health system, and other health care facility sites, like the Mayo Clinic and Cleveland Clinic. Is research important in the massage profession? Because what we do as massage therapists can impact someone’s health for better or worse, it is in everyone’s best interest to make decisions on treatment based on solid scientific research whenever possible. It is true that a measure of massage falls into a general “feel good” category. Even so, research has overwhelmingly demonstrated that stress reduction is vital for continued good health and mental well-being. Outside of that, there are many persons that come to massage therapists for relief from a wide range of physical ailments. Knowing which techniques and modalities help, which are ineffective, and which may even exacerbate a given complaint, with some certainty, is vital for a therapist to successfully treat these conditons. Conditions may exist in a client that are not the reason for why they wanted a massage, such as in the case where they have a backache but also poison ivy. During assessment, these issues should be brought out and evaluated prior to formulating a treatment plan or even in deciding if it is advisable to offer treatment at all. There may be times when we, as the practitioner, should deny service to the client, in full or in part, either for their protection or that of ourselves. Knowledge is power and reliable research is key to gaining accurate knowledge in all of the above areas. The reason why I chose to check into research on whether or not massage spreads cancer and if it should always be contraindicated is becuase I have a personal interest in this topic, since I have a close friend with cancer who is currently receiving regular massages. In a question found on the Breastcancer.org site from 2010 (1) titled “Does Massage Contribute to the Spread of Breast Cancer Cells to the Lymph Nodes?“, the answer given by the staff expert, Tracy Walton, L.M.T., M.S., indicated that uncited research points to the fact that exercise and hot showers would pose more of a risk of spreading cancer cells than massage, if increasing blood and lymph flow were dangerous to the cancer patient. Looking further, the American Massage Therapy Association site has a page where this topic is closely looked at in a well-cited article. (2) In it, the way cancer spreads, or metastasizes, is discussed. Four ways cancer can spread are brought out with focus given to the overwhelmingly prevalent way lethal cancers are found to metastasize, which involved blood circulation metastasis. Since massage therapy significantly impacts blood flow, concern is warranted in this area. The three steps of the process of metastasization are looked at one by one. The first is when the original tumor sheds cancerous cells into the body. The conclusion made in the article was that if the tumor was close to the surface of the body, that vigorous massage or hydrotherapy should be avoided in that area to minimize risk of expediting this shedding of cells. 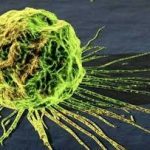 Next the cancer cells need to stay alive while moving through the blood or lymphatic system living off of whatever nutrients they carried until they could re-site. Their opinion was first that the more vigorous the flow, the less likely it would be for a cell to be able to root in a remote location before it ran out of nutrient. Also,because since more active patients tended to do better in the recovery process because of improved physiology, exercise, which inherently increased blood flow, is generally considered a positive influence. Finally, the cells need to latch onto tissue in the new spot to complete the migration. There appears to be no solid evidence, either for or against massage, as having an effect in this end stage of metastasizing. The article ends with summarizing that firm, vigorous and direct stimulation to superficial tumors should be avoided. This is best done through a careful pre-massage assessment which would include determining the exact location of any known tumors in the client. Finally, continuing on to find some results of an actual double-blind study is information from the Journal of Pain and Symptom Management Report on a study conducted at the prestigious Sloan-Kettering Cancer Center (3). The results indicated that massage should be applied to relieve symptoms in patients with cancer. This practice was, up until the time of this test, only supported by evidence from small trials and anecdotal evidence. No study had examined massage therapy outcomes in a large group of patients. In the Memorial Sloan-Kettering Cancer Center testing, patients reported symptom severity pre- and post- massage therapy using a 0-10 rating scale of pain, fatigue, stress/anxiety, nausea, depression and “other” categories. Changes in symptom scores, and the modifying effects of patient status (inpatient or outpatient), and type of massage were analyzed. Over a three-year period, 1290 patients were treated. The findings? Symptom scores were reduced by approximately 50%, even for patients reporting high baseline scores. Outpatients improved about 10% more than inpatients. Benefits persisted, with patients experiencing no return toward baseline scores throughout the duration of 48-hour follow-up. These data indicate that massage therapy is associated with substantive improvement in cancer patients’ symptom scores. See figures in original article. Do research findings support the statement/treatment or not and in what way? After reviewing the cited articles and research, the information that I found tends to refute the statement that massage spreads cancer and is always contraindicated. While there are aspects that the practitioner should be mindful of when treating a cancer patient, research supports a viewpoint that massage is actually helpful to cancer patients in the areas of relieving pain, fatigue, anxiety, nausea, depression and other side effects of treatment of the disease, while posing no significant risk of spreading the tumor(s). Any modality or treatment with that sort of success rate should not be put aside out of groundless fear, especially when there is no clinical proof that massage has caused any harm to these patients. What implications does the knowledge have for you and your practice? Based on what I discovered in the research, and articles that I have reviewed on this topic, I believe that massage is not globally contraindicated, but, in fact, is actually useful to the cancer patient. It reaps significant positive results so long as appropriate boundaries to the client’s individual situation are maintained. Since the benefits to the cancer patient are well documented in reputable research findings, and include a wide range of physical and mental improvements for the client, I would be happy to include such treatments in my practice using caution. Additionally, since the population in our country trends toward older as well as heavier individuals, which are more prone to cancer, it can be expected that the number of incidences massage therapists see in this area will also increase. I foresee an expanding market for these services and it could even be wise to consider specialization in providing relief for this group of clients. Massage Therapy research is important. Even though massage has been utilized for centuries because of it’s therapeutic applications, its credibility as a complementary therapy in treating maladies has only recently gained recognition in western medicine. This is a result of pioneers in the industry leading the way in quantitative and qualitative research. Research is critical, not only to back claims made in the industry, but also to question the efficacy of any given treatment. In this way, the massage therapist and client can have confidence in the treatment that’s being implemented, expecting the best results. Also called longitudinal studies, involve a case-defined population who presently have a certain exposure and/or receive a particular treatment, that are followed over time and compared with another group who are not affected by the exposure under investigation. A type of randomized controlled clinical trial/study in which neither medical staff/physicians nor the patient knows which of several possible treatments/therapies the patient is receiving. Meta-analysis is a systematic, objective way to combine data from many studies, usually from randomized controlled clinical trials, and arrive at a pooled estimate of treatment effectiveness and statistical significance. I chose to research the statement “Massage is safe for anyone with cancer 5 or more years after treatment.” My mother survived cancer, so I have witnessed first hand the pain and suffering this disease inflicts on individuals and their families. The American Cancer Society estimates 1,658,370 U.S. citizens will fall prey to cancer in 2015. 2 These numbers are staggering and indicate how great the demand for quality care is. In light of this demand, does research support the safety of massage therapy during each stage of treatment and well into remission, 5 years and longer? My findings lead me to conclude that massage therapy is safe for cancer patients in all its phases, if performed by a credentialed and experienced therapist. There are valid reasons why massage therapy is one of the leading integrative therapies most often used for cancer patients seeking pain relief.6 Touch through massage induces a feeling of calm, is comforting and is especially effective in countering some of the necessary invasive treatments patients must undergo, mainly through providing pain relief. I, personally, am encouraged by these findings. Of the many prospects massage therapy offers, providing comfort and pain relief inspires me the most. 3.Mitchinson, A., Fletcher, C., Kim, H., Montagnini, M., & Hinshaw, D. (2014). Integrating massage therapy within the palliative care of veterans with advanced illnesses: An outcome study. Am J Hosp Palliat Care., 31(1). doi:10.1177/1049909113476568. 4. Dryden, T. (2012). Corbin, Deng, et. al. In Massage therapy: Integrating research and practice. Champaign, IL: Human Kinetics. 5. Dryden, T. (2012). Janice E. Post-White. In Massage therapy: Integrating research and practice. Champaign, IL: Human Kinetics. 6. Dryden, T. (2012). Boon, Okitunde and Zick. In Massage therapy: Integrating research and practice. Champaign, IL: Human Kinetics. There are two main types of research in the massage therapy profession. Basic research is normally conducted in a lab setting and measures information at the molecular, cellular and tissue level in the body. This type of research is used to optimize protocols and develop both applied research questions and translational research programs. The other type of research is clinical, or applied, research, and most massage research falls under this category. This type of research uses investigations on a functional level to test a specific measurement of the effects of massage on the body. In clinical or applied research, experiments are carefully designed to include two groups; a control group does not receive any treatment or receives a “sham” treatment and a group that actually receives treatment. The researchers are careful to control or document independent variables and the data collected is carefully analyzed to produce correct results. Other types of research include analytical research which focuses on complex issues and mechanisms and descriptive research which is based on surveys and interview questions. In my opinion, all types of research in the massage therapy profession are valid. Some effects of massage therapy can be easily measured and validated. For example, range of motion and density of scar tissue can both be objectively measured to determine if there have been improvements or not. Some effects of massage therapy are subjective and based on the subject’s perception of improvement or lack of. For example, pain management, depression and anxiety can be measured on standardized surveys but the changes (or lack of) will be affected by the subject. Some of the issues that affect a subject’s perception are the belief that the treatment will work and their overall opinion of massage therapy. There is still work to do to improve research in massage therapy and this is made more complicated by the mind-body connection of massage and the varied systems it affects. Continuing to improve methodology and finding new ways to measure results is important to the future of massage therapy research. Massage therapists can benefit greatly from staying on top of new developments in their profession by reading research studies and thinking critically about the results before putting them into practice. They must understand the criteria that makes research valid and correct. The most important criteria is to consider the source of the information. There are an overwhelming number of website that have massage information and determining the credentials of the publisher is important. A peer-reviewed journal is the best source to review research articles. These articles have been reviewed by other professionals for experiment design, methodologies used, correct data analysis and repeatability of the study. Other good sources are professional association websites, such as ABMP or AMTA. With any information, the massage therapist must think critically about what is being said and do further investigations into any questions they may have. In my opinion, research is very important to the massage profession today. Research allows massage therapists to gain knowledge for ourselves and for our clients. We can use new information from research to better treat our clients and to be able to answer the questions they have about the way a technique affects the area it is being applied to. Research gives massage therapy validity in the medical community. This allows massage therapists to talk to members in the medical community about massage and how it can assist their patients. It also opens a path for insurance reimbursement making massage more affordable to more clients. Research in massage therapy that is done by massage therapist helps us to define our profession and helps to change the attitude that massage is an activity of self-indulgence or as a cover for other activities. I chose this statement because I have a strong interest in this area. The information reviewed for this statement includes “Massage therapy for cancer patients: a reciprocal relationship between body and mind” (Sager, SM and R.K. Wong. Current Oncology, Volume 14, Number 2, pp 45-54). For background information, I also read through the article “Could Massage Therapy Promote Cancer Metastasis?” dated 21 September 2000 from the website www.amtamassage.org/articles/3/MT/detail/1803 . The background article “Could Massage Therapy Promote Cancer Metastasis?” gives important information on how cancer metastasizes. The main ways cancer is spread is by direct contact to nearby structures, through body cavities, bloodstream (hematogenous metastasis) and through the lymphatic system (lymphogenous metastasis). It discusses the event cycle for both hematogenous and lymphogenous metastasis as massage directly influences the flow of these systems. The conclusion is that massage does not promote metastasis through these avenues as patients are also advised to exercise and stay active–both of which contribute to the same system flows as massage. 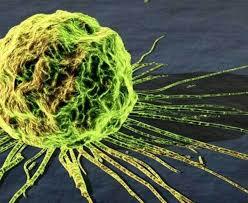 The bigger concern is metastasis through cell shedding from the primary tumor. There is concern that direct pressure or other strong stimuli applied directly on the tumor or near it, with greater risk being involved if the tumor is near the surface of the skin. The solution in this case is for the massage therapist to get as much information as possible about the tumor’s size, location and depth and to avoid deep pressure at the site. Overall, the article concludes that cancer is not spread by massage and that it is up to the therapist, physician and patient to determine the risks of massage on cancer patients. The main article reviewed discussed several research studies done on cancer patients for symptom control. The symptoms that were measured in most of these studies included pain, fatigue, depression, stress and anxiety. The main focus of most of the studies seemed to be on depression and anxiety. The authors discussed the strengths and weaknesses of the studies reviewed, acknowledging both the strengths and weaknesses of each study. Overall, the studies reviewed showed conflicting results. And the authors acknowledged that the symptom improvements may be due to many factors including belief of benefit (placebo effect), verbal communication, background music and aromatherapy. The authors stated that a better understanding of the mechanics of therapeutic massage is necessary with focus on the physiologic pathways and the connection between myofascial manipulation, blood flow and central nervous system adaptations. The article goes on to describe massage techniques in the Western tradition and Eastern tradition. The next section discusses the safety of massage therapy and states that it is safe when administered by a licensed massage therapist and that complications are rare. Any adverse effects of massage were generally due to massages done by laypeople or if techniques other than Swedish massage were used. The article lists special situations that the massage therapist needs to be aware of in cancer patients and advises avoiding massage or lightening the touch over areas that pose risk. The article goes on to discuss the qualifications of the massage therapist in both the US and in Canada. The typical standard in the US is 500 hours and 2200 hours in Canada. It points out that massage therapists working with cancer patients need to have special training and education. The article discusses the reasons most clients get a massage, including back symptoms, relaxation, neck symptoms, mood disorders and leg symptoms in addition to cancer related symptoms. The authors conclude that the evidence is sufficient that therapeutic massage relieves a variety of symptoms and that clinical trials need to have a better design to determine which techniques are most efficient. The article also states that studies are necessary to understand the psychophysiological effects of massage and how they influence clinical practice. The article discusses the relationship between the physical and mental effects of massage and poses the question of whether it is better measured in the realm of psychotherapy instead of a medical model. The authors acknowledge the connection between the physiologic and the subconscious effects of massage. The article concludes that the relationship between the mechanistic effects of massage and the relief it provides are inconclusive and acknowledges the connection between the body and mind. The authors determine that more studies are necessary to understand this connection in relation to symptom control in cancer patients. The research findings do not support the statement that massage of cancer patients can spread cancer and is always contraindicated. Both articles support the use of massage therapy in relief of cancer symptoms by a trained massage therapist. The articles provide information on how cancer is spread and that there must be special training of the massage therapist with excellent communication between the massage therapist, physicians, and patient. Both articles provide information on special considerations of clients with cancer and solutions on how to safely massage those clients. The implications of this knowledge for me and my practice are widespread. It removes the fear of harming a client with cancer and concern that massage therapy can contribute to metastasis of cancer. It also reinforces the need for special training in order to safely perform massage therapy on clients with cancer. There is a need for elevated communication with the client and physician in order to avoid tumors that are close to the skin. This knowledge reinforces the need to understand cancer and the many side effects of the treatments available including knowledge of drugs and their side effects. This knowledge reinforces the need for a deep understanding of what is a local contraindication and what is an absolute contraindication for clients with cancer. Most importantly, the article confirms the connection between the mind and the body and how this connection can relieve common symptoms of cancer. The article confirms that physical touch affects the mind and the body and touch is safe for all clients with the proper knowledge and training. I have a friend who several years ago was diagnosed with a recurance of her breast cancer after 15 years of being cancer free. Needless to say, this was a very traumatic and emotional time for her, her family, and friends. One of the hardest things for anyone dealing with a cancer diagnosis and treatments is how others relate to them. 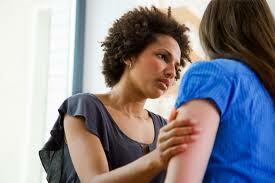 And, one of the hardest things for friends, family and acquaintances is knowing how to help and not make it worse. And, in our attempts to support and show caring, we often say exactly the wrong thing. There is no one right answer to what to say but the best guide is to take your cue from the person you are relating with. Just like anyone else, a person with cancer will sometimes be angry, depressed, amused, positive, helpless, independent–in other words, human. When I, and my family and friends, were working through the experience of cancer, I created a one page Cancer Guide (pdf) to help make it easier to feel positive and comfortable that were are positively supporting the person with cancer. In our culture, about 1 in 3 people will be diagnosed with cancer at some point, so all of us will be relating to someone we know and care about with cancer. Hopefully, this guide will go along way to help us support and be supported during that journey. For more information and support when faced with cancer in you or a loved one or friend, check out Cancer Support Community of Central Texas (or find one near you).